Natural greenish-yellow titanites from two localities in Brazil (Bananal/Capelinha, MG and Xambioá, TO) were characterized by electron paramagnetic resonance (EPR) and optical absorption. Along with vanadyl ions (VO2+) substituting Ti4+, two other paramagnetic centers were identified: the Fe3+ and the Mn2+. For the VO2+, the principal values and orientations of the g and A tensors were derived from a careful analysis of the angular dependence of the EPR spectra. The obtained results, although different to previously reported data, still support the model for the VO2+ bonds to the nearest oxygen (O1) in the TiO6-distorted octahedra. In addition, the titanite optical absorption spectra were analyzed, and the yellow color was ascribed to Fe3+ ↔ O2− ligand–metal charge transfer transitions (LMCT) in the near-ultraviolet, extending to the violet and blue spectral ranges. The VO2+ center seen by EPR was in low concentration and had no visible effect on the color. Finally, γ-irradiation up to 200 kGy and thermal treatments in oxidizing/reducing atmospheres up to 600–700 °C also had no big influence on the dominant yellow color. 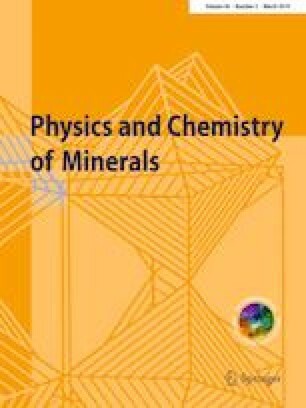 The authors are grateful to CAPES—Coordenação de Aperfeiçoamento de Pessoal de Nível Superior, CNPq—Conselho Nacional de Desenvolvimento Científico e Tecnológico and FAPEMIG—Fundação de Amparo à Pesquisa do Estado de Minas Gerais for grants and financial support.